This Kohler K-560-VS Bellera low-priced faucet captures the classic simplicity of a single-lever design impeccably by not going overboard with the features. With the included escutcheon there’s the option of a 1- or 3-hole installation, a great inclusion to suit a range of kitchen setups. Having an alternative to the 1-hole installation also lets consumers add personal touches that are not available in other models. More room is provided thanks to the high-arc spout design and 360-degree rotation. It gives you as little or as much clearance as you want and can be turned completely out of the way if needed. The water temperature and power are both controlled by a single forward-facing lever handle, all without extra complicated knobs that just take up the room. The built-in spray head has 3 main functions that include an aerated flow and pause button, giving you full control over both appliances regardless of how they are used. The Kohler K-560-VS Bellera is a great buy for the consumer that just wants a simple high-arc spout that is low-cost and easy to install in any kitchen. Using a self-contained ceramic disc valve means the volume and temperature are controlled by 1 piece rather than using separate mechanics, simplifying the operation of the faucet. One of the great advanced functions is the temperature memory that lets you keep the current temperature when you turn the faucet on or off. The Kohler K-560-VS Bellera is a good option for people who do a lot of cooking in the kitchen and need the water set to a certain temperature. Rather than having to press a button to change from stream to spray water flow the unit uses touch control, a feature that takes the worry out of having dirty hands when operating the faucet. Using the spray head is a joy because of the Promotion technology, developed through the use of a nylon hose and ball joint so that you don’t have to worry about it degrading over time. These same flexible connections also make it easier to install, and the faucet meets CAL green certifications as well as many others. The corrosion and tarnish resistance goes a step further than most and exceeds industry standards twice over, a marvelous accomplishment that could only be achieved by Kohler. Kohler also supplies an installation ring to make the process painless and simply one of the best in the industry. The Kohler K-560-VS Bellera is one of the highest end models from the Bellera collection and is highly sought after for modern kitchens. The available finishes are vibrant stainless steel, polished chrome, and oil-rubbed bronze. The flow rate and water consumption are both a steady 1.8 GPM and the entire unit comes with a lifetime limited warranty under the name of the original owner. The product dimensions are 16.75 x 10.5 x 7.875 inches for height, width, and depth, respectively, so make sure to check your available space before purchasing. The hose is about 19.5 inches long when fully extended, which can be even longer depending on how you loop it during installation. So if you want a longer hose then you’ll have to plan for it at the time of installation or else risk having to start from scratch. The installation also includes a magnetic head which means it snaps back into place when you retract it, without the need to worry about it wearing out. This secure method of retracting the spout will last for years without needing to be replaced. The handle moves right for on, left for off, front for cold, and back for hot. The included user guide leaves a lot to be desired and could cause some headaches if you follow the installation instructions word for word. An updated version of the manual is online and can also be requested from the company directly if needed. 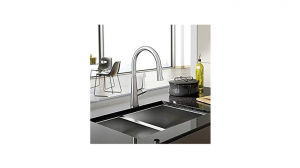 With the metal components of the faucet and rubberized buttons, this is a kitchen faucet that is built to last and will have very little issues over the years. The FLG Deck Mount Solid Brass Pull-Down Sprayer Swivel Kitchen Sink Faucet with Two Spouts would be the closest comparison and actually beats the Kohler on price. Where it fails is obviously on quality, with the FLG having considerably less reliable parts and even an undesirable and dull finish. It’s unremarkable but extremely functional if you don’t mind quick wear and tear. Surprisingly, the installation is easier with the FLG than it is with this specific Kohler model, so it does get points for that. Still, with the above issues, the obvious choice is going to be the Kohler for the quality, regardless of the installation headaches. The Kohler K-560-VS Bellera is already at its lowest price ever, so it makes sense to buy it while it’s so low if you’re interested. The Kohler K-560-VS Bellera has never really been a high-priced item and has steadily gone down over time, most likely to rival other products in the Ballera line. It will be at its best price during the holidays so if you’re on the fence about buying it now, wait until closer to the end of the year to purchase. Stock is still pretty high but keep an eye on it anyway. There really isn’t a lot to dislike about this product that comes from one of the biggest names in the industry. With all of its features, Kohler managed to cram so much into this small device that it’s a wonder the product is as durable as other units with fewer features. The price is just about right and hits just below average to intice a lot of would-be consumers that haven’t made up their minds yet. At such a low price, it is a great buy with top-tier features that give consumers a taste of the company’s the higher-priced models. This is the best in the Ballera line and a good introduction for any consumer interested in switching their old faucet out. The user manual issues may bother consumers that are beginners to the process, but for intermediate users the installation will be just as easy as installing any other kitchen faucet. Kohler does a great job with its luxury models, and this faucet is no exception. It has been exceeding exceptions for a while now and keeps getting better with time. As this is one of Kohler’s better creations, Consumers are advised to check it out and make their own decision as to whether this is what they want in their kitchen. Chances are this is not only what they want, but what they need. This is one of the best kitchen faucets on the market and well worth your money.